This page created 1st May 2003 using Notepad, by Ian Smith. Gilfords were to London suburban coach operators what Leyland Titans were to the city Independents: the vehicle of choice. Gilford was a High Wycombe based manufacturer that after a period reclaiming and refurbishing First World War battlefield relics had become a chassis builder in its own right. Its lightweight coach chassis was just what was needed when the explosion of London suburban building of the 1930s brought rapid expansion in independent coach services to those parts not reached by the Southern Electric or Metropolitan/District Railways. It even had a coach-builder next door to supply bodywork. There were other body-builders too: these were the days when bus operators small as well as large had favorite or local builders to support. So the Gilford appeared with bodies by Wycombe, Strachans, Petty, Metcalfe, Duple, Thurgood, London Lorries, Beadle and Wilton. GW713 was NOT one of the Gilfords acquired by Green Line or London Transport, but is one of the few surviving operable Gilfords. It worked for Valliant in London, and was preserved in the late sixties. It is seen here at Stratford Rally in June 1970. It is now in the Science Museum at Wroughton. The Gruss air cylinders behind the front bumper are clearly visible. 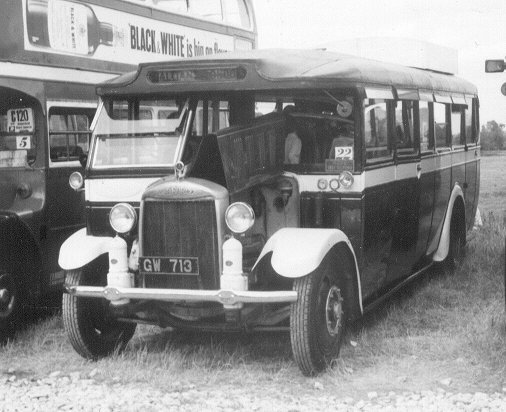 For small-bus work Gilford produced the 20-seater normal-control CP6, with Buda 4.55 litre engine, followed by a revamped AS6 model for the same task. Please note: Rear view photos of identifiable Gilfords are rather rare, so the rear views shown in the drawings are largely conjectural. I am also uncertain whether doors in the rear were added by London Transport where there were insufficient emergency exit doors, or whether they were in from new. Also please note that I have seen NO colour photos of Gilfords, and despite what some bus enthusiasts maintain one really cannot determine colour from black & white photos! On the other hand it is likely that the colour scheme used by LT was the same as that on the Regals, the second being "mid-green" and "apple-green", as on T213 in the LT Museum. Orange wheels? - probably, for a time. Skylark Motor Coach Co began operating from Oxford Circus to Guildford in 1928, and in 1929 introduced a London to Hertford service which was quickly added onto the Guildford service - the foundation of a long-standing cross-London express service. They also added a service between London and High Wycombe, and one to Dorking. Their choice of Gilford was the SD normal-control type, the 1928 and 1929 deliveries having the shorter wheelbases, the 1930 batch the longer, all with Duple 26 seater bodies with two doors. Green Line took over the company's services and coaches in February 1932. The services became AF to Hertford Heath, BG to Guildford and AQ to High Wycombe. The Gilfords acquired Green Line labels on their Skylark livery, and were numbered GF1-18 in the Green Line series. When London Transport took over in 1933 it had plenty of decent coaches for Green Line work, but a motley collection of single decker country buses. The normal control Gilfords were ideal for conversion for bus operation, with the prospect of one-man operation if downseated to 20 seats, and all the Skylarks were so treated, losing their fleet numbers in the process. (The Country Area at first continued the LGCS practice of not using fleetnumbers). They regained numbers - in the bus sequence - in 1935, when Chiswick took control of maintenance of all the London Transport vehicles. Windsor and Slough garages used several of them. They were early casualties of London Transport's standardisation policy, when the Leyland Cub was chosen as the standard Country Area small saloon. GF1-3 and GF5-6 were sold in 1935 without receiving new numbers. GF7-18 became Country buses GF127B to GF138B (not in sequence), but were all disposed of early in 1936. The ex-GF4 had a brief reprieve from store, being transferred to the Central Area as GF193 in September 1935, repainted red/white for the 203 start-up route from Purley to Mitchley Avenue. With the other two involved it was replaced by DA-class Darts in spring 1936. Regent Motor Services of Hornsey also established an hourly London - Hertford Service. When taken over by Green Line in March 1932 they brought with them four Gilfords, that were numbered GF19-22. GF19 was later renumbered GF23. Of these four, at least two had Duple forward entrance coach bodies, and one (GF21) a Wilton dual-door body. After takeover they continued at first in Regent livery, to maintain their established customer base, with Green Line transfers to denote their change of ownership. When London Transport took over GF19 (now GF23) and GF22 were retained as Greenline coaches, while GF20 and GF21 became un-numbered buses. In 1935 the ex-GF20 was reinstated to coach duties, as GF65C, while the ex-GF22 was renumbered as bus GF164B. Bucks Expresses operated a frequent service from Watford to Oxford Circus starting in September 1929, for which they bought five Gilfords (as well as two AEC Regals). These came to Green Line, on route AW, when acquired in February 1932. The older pair, now GF24-25, were 166OTs (16ft 6in forward control), with Wycombe C26F bodies, while the 1930 trio, GF26-28, were 168OTs with London Lorries C26F bodies. Three (GF 25,26,28) were retained as Green Line coaches by London Transport, with GF24, 27 demoted to bus duties. Ex-GF 27 was reinstated to coach work in 1934, as GS34, when the ex-Hillman Greenline coach with that number was withdrawn. Ex-GF24 became GF172B in the 1935 bus numbering. All four coaches were withdrawn in 1936 and sold, while the bus survived until December 1937. Associated Coaches of Ongar were operating a service between Bishopsgate and Ongar and Chingford by the time that they were acquired by Green Line in March 1932, using a Forest King fleetname. GF29 and GF30 were normal control 166SDs with Wycombe C26F bodies. GF31 and GF32 were older tiny 20-seater Duple-bodied CP6s. GF33-35 were forward-control 166OTs with larger Wycombe C29F bodywork. Green Line operated them as route AO. Only GF33 survived with Greenline into London Transport days. The rest were officially reclassifed as buses and lost their numbers. GF29-32 were all sold without being renumbered, while GF 34 and GF35 became GF147B and GF141B respectively in 1935. Acme Pullman operated from Charing Cross to Bishop's Stortford and Newmarket, and were acquired by Green Line in September 1932. The service continued to be run under the Acme name, both on the vehicles and on publicity. As the route beyond Bishop's Stortford was outside the area that the company was going to be allowed to operate under the upcoming legislation that section of route was sold off to Varsity Express Motors. Acme brought fourteen Gilfords to Green Line, which became GF36-49. GF41-49 were the later 168OTs with C31F bodies by Petty. These too all became Country Area buses. GF 44 became GF146B, and the others gained numbers in the ranges GF177B-181B and GF183B-185B. All the ex-Acme buses were relatively long-lasting with LT, surviving to sale in December 1937. Green Line had started a London - Potters Bar service in September 1930. The operator of the local station bus service, Joe Lewis, started his own service between Brookman's Park and Charing Cross. He operated hourly throughout the day. Four small 20-seater Gilfords were operating by spring 1931, followed by a pair of larger Gilfords - a second-hand 26-seater Duple 166SD and a 32-seater Duple 168OT. Green Line bought out the operation in July 1933: Joe Lewis operated up until the last day before the new London Transport Act took effect. London Transport's Green Line took over the service - cut back to Portman Square from Charing Cross - as service BR. The two larger Gilfords came with it. But it quickly dwindled, as passengers missed the personal service of Joe and his fellow drivers and the convenience at the London end of the Charing Cross terminus. The two acquired Gilfords, GF50 and GF51 in the first series, became Country Buses, GF142B and GF190B respectively. On 1st July 1933 the London Passenger Transport Board came into being, and acquired the buses and coaches of London General, including most of the Country Services vehicles and Green Line. A new chapter was beginning.